The new Customary and Religious Law Interest Group held its very first meeting this weekend in San Antonio! We are very excited to report on the meeting and to encourage all of you to join us in this new endeavor. As a preliminary matter, the members who attended the meeting decided to keep the current name and the acronym “CARLIG.” We also decided that all group communications should take place through the My Communities group to whatever extent possible. The group then spent the remainder of the meeting discussing potential projects on which to work in the coming year, as well as ideas for programming proposals for next year’s Annual Meeting in Philadelphia. The group decided to work on developing bibliographies or collection guides containing “critical resources” that every library should have in building a minimum core collection. 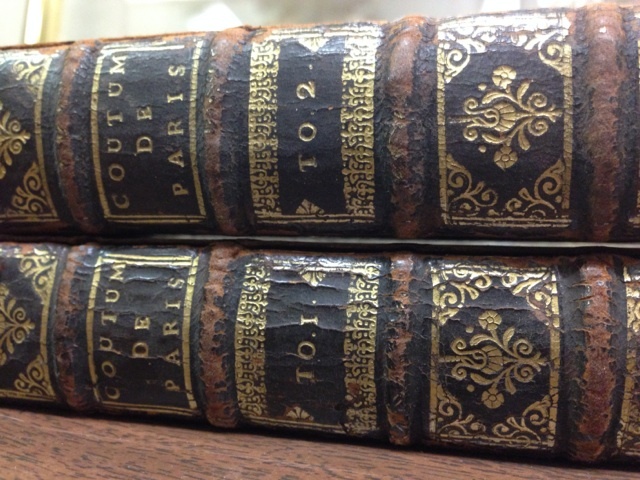 Collection guides will be created for the different religious law and canon law systems, and for customary legal systems and customary law in general. The second project on which the group would like to work in the coming year is to identify the major collections in each area of interest. With regard to programming, it was suggested that because the group’s interests are somewhat esoteric, we may want to focus on ideas for informal programming, such as coffee talks and book discussions, in the event that our formal proposals are not accepted. The group agreed that this was an excellent idea and will watch for interesting books and discussion topics around which to build informal programming in Philadelphia. The group also discussed ideas for formal programming, including topics that may lend themselves to collaboration with other AALL groups, such as the Legal History and Rare Books SIS. Because of next year’s location in Philadelphia, which is close to Amish and Mennonite communities in Pennsylvania, the group intends to develop a proposal addressing the accommodation of religious minorities in larger communities. Other ideas included programs on teaching customary law research in FCIL research classes, family law and/or women’s rights issues in mixed legal systems, the resurgence in witchcraft accusations in a number of customary law communities in different parts of the world (as well as a potential tie-in with similar accusations occurring in Louisiana and Florida Haitian voodoo communities), and medieval customary laws in Europe and their influence on modern laws and legal systems. After meeting on Sunday, the group reported its activities at the FCIL-SIS business meeting on Monday morning, which seemed to generate even more interest in the new IG. We hope that more AALL members will join our roster and share their ideas for projects and programming. As chair of the new group, I will be contacting everyone who has expressed interest over the next few days so that we can get the ball rolling on developing our projects and programming proposals. I will also be creating a forum in which we can all share our ideas and work to develop our programming proposals. In the meantime, if you wish to participate or to follow the group’s activities, please join our My Communities group to receive notifications as they post. 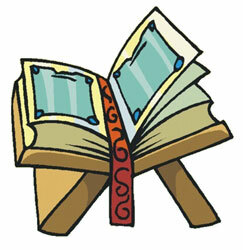 We look forward to sharing our interests with the AALL community. Introducing the FCIL-SIS Customary and Religious Law Interest Group! The FCIL-SIS is excited to announce the formation of a brand new Interest Group just in time for the Annual Meeting in San Antonio. 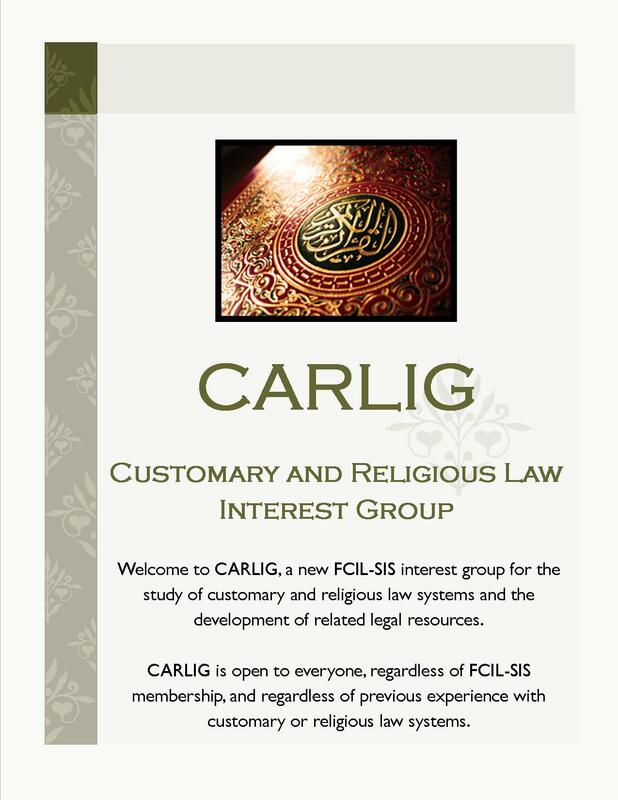 Currently going by the name of “CARLIG” – an acronym for “Customary and Religious Law Interest Group” – this new IG will provide a forum for AALL members interested in the research and study of all types of customary, tribal, religious, and canon law systems. CARLIG will hold its inaugural meeting on Sunday, July 13, 2014 at 7:00 AM in Marriott Rivercenter-Salon C, as part of the FCIL-SIS Subject Groups meetings. We will discuss leadership and group structure, future projects, potential programming proposals for the 2015 Annual Meeting in Philadelphia, and much more. Given the many FCIL-SIS members who have already expressed interest, the new IG is sure to gain traction and provide us with a forum to discuss and work on projects relating to these often overlooked areas of foreign law. Whether you already specialize in religious or customary legal systems, have a work-related or “extracurricular” interest, or simply want to learn more about what they are, we encourage you to join us for our meeting in San Antonio! For additional information, or to be added to our membership list, please contact Susan Gualtier at susan.gualtier@law.lsu.edu and join our My Communities group to receive notifications relating to future projects and events.